Universal Tool Precision Pistol Air Drills feature machined carbon fiber blades for lubrication free operation, the highest precision engineering that ensures 600,000 cycles of use and an internal silencer baffle that reduces noise pressure level to 75 dBA. Universal Tool Precision Pistol Air Drills feature precision needle bearings and gears and a gear case that is interchangeable with leading brands, an advanced ergonomic handle design with insulated coating for maximum operator comfort, a ported throttle valve for precise variable speed control and is best for continuous precision air frame work. The UT8892-5 Universal Tool Precision Pistol Air Drill is one of thousands of quality tooling products available from MRO Tools. Please browse Universal Tool Precision Pistol Air Drills for tools similar to the UT8892-5 Universal Tool Precision Pistol Air Drill. 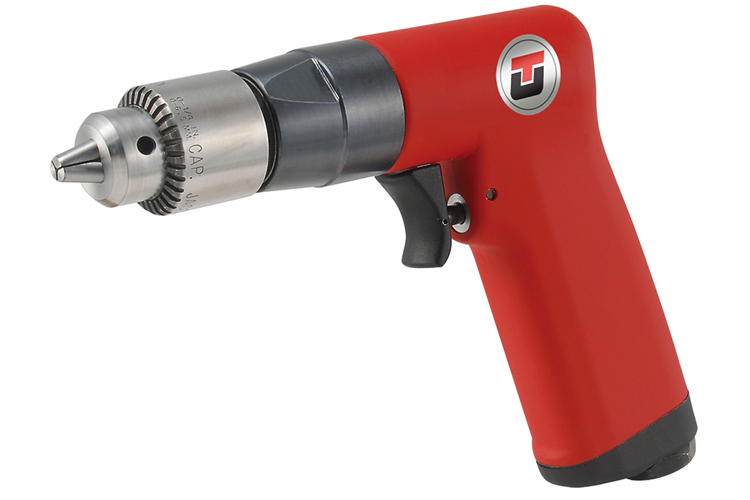 UT8892-5 Universal Tool Precision Pistol Air Drill description summary: UT8892-5 Universal Tool Precision Pistol Air Drill. Motor (hp): 0.45 Motor (Kw): 0.33 Gear Ratio: 40:1 Speed (rpm): 500 Exhaust: Rear Chuck: 1/4'' Weight: 1.30lbs/0.60kg Length: 7.50''/191mm Quantity discounts may be available for the UT8892-5 Universal Tool Precision Pistol Air Drill. Please contact MRO Tools for details.